What is it that we love about Batman? Why has “The Dark Knight,” director Christopher Nolan’s latest addition to the comic book franchise, made so much money and attracted so many fans? Of course it could be the gadgets, the jaw-dropping car chases or the chiseled cheekbones of Christian Bale. I suspect, however, that its popularity stems in large part from its close resemblance to another famous story of good and evil. I saw “The Dark Knight” when it first was released, but it was only later, when I was discussing it with a close friend, that I realized just how theological it is. Consider the story of Bruce Wayne/Batman. Bruce’s father is building a better world for the people of Gotham, yet it is up to his son, Bruce, to finish his work. Meanwhile, Batman’s good works are looked upon skeptically by the authorities and citizens of Gotham, though there are a few followers—especially children, such as Lieutenant Jim Gordon’s son—who see through the uncertainty and understand Batman for what he truly is. Batman’s debt to the Gospel stories seems indisputable. One of the questions Nolan struggles with is what it means to be a hero. A hero is obviously someone who fights for good and saves the day—but are not heroes also supposed to be beloved by those he or she serves? Bruce/Batman is certain he is helping the city, but the citizens are not so sure. Is he truly a hero, or simply an uninvited vigilante? Ultimately, Batman “becomes” what Gotham wants him to be—a criminal—by taking the wrap for Harvey Dent’s crimes because it is ultimately best for Gotham. One can’t help but be reminded of Jesus’ capture and trial by Pontius Pilate. When asked if he was the king of the Jews, Jesus’ only reply is, “You say so.” Christ did not protest when his people put him to death in the place of another criminal, because, after all, he was dying to save us from sin and death. The Joker, meanwhile, bears an uncanny resemblance to what Revelation calls “the Adversary.” Heath Ledger’s sinister portrayal of the Joker makes Nolan’s film much more intriguing than Tim Burton’s "Batman" (1989). From the beginning we see that the Joker is disturbingly smart—in the opening scene his plan to rob a bank unfolds with terrifying efficacy. Next we find out that despite his wacky appearance he can hold his own with the dirtiest of Gotham’s criminals—in a few short scenes he shows the Gotham mob what he is capable of. Yet what perhaps the most unsettling aspect of the Joker is that he is nameless. How many times in Scripture do we encounter the “Evil One” cunningly creating chaos in the lives of others? Just like the Joker, the devil has no discernable form or story, no apparent motive aside from pulling people away from the path toward goodness. The Evil One focuses on people’s weaknesses and exploits them, just as the Joker did with Harvey Dent, appealing to his deep desire for justice to persuade him that the only true form of justice is chaos. Perhaps I’m making too much of “The Dark Night.” Maybe it’s just a good flick, entertaining and action-packed. Ultimately, however, I think there is something more behind its popularity. We are made in Christ’s image, and we all have the ability to be like him, to sacrifice ourselves for the good of others. At the same time, we have all fallen prey to the temptations of the “Evil One.” With “The Dark Knight,” Christopher Nolan has tapped into the deep divide in the human heart, and put it all up on the screen for us to see. "The Dark Knight" is certainly an intense film. As we watch this classic story of good versus evil, the audience is left sitting and wondering: how will it all turn out this time? Religious imagery can be found in both Batman and the Joker, but I want to focus on two other figures in the film. Both Harvey “Two-face” Dent (Aaron Eckhart), the industrious district attorney struck by tragedy, and Lieutenant Jim Gordon (Gary Oldman) represent characters that the audience can relate to. The “Dark Knight” and his nemesis may entertain us with their outsized portrayals of good and evil, but in the end we know they are only cartoons. Dent and Gordon, on the other hand, can look eerily like ourselves. As we watch Dent “clean up Gotham City” without wearing a mask, we see a human depiction of goodness very unlike Batman. We place our faith in this lawyer extraordinaire as he relentlessly pursues Gotham City’s criminals. Yet our faith turns out to be misplaced. Christ warned his followers to “Beware of false prophets, who come to you in sheep’s clothing, but underneath are ravenous wolves” (Mt 7:15). Dent proves to be such a prophet. He is the secular messiah who ultimately disappoints his followers. By the end of the film it becomes painfully obvious that Dent is a dualist. Theologian Elizabeth Johnson notes that, in practice, Christians are far more likely to view Jesus as “truly God” than “truly human,” even though he is of course both. Dent, perhaps more than any other character in pop-culture, exemplifies this unhealthy dualism. The audience is so quick to embrace Dent as a savior that we forget that not even Batman is without fault. Behind the mask, he is only Bruce Wayne, a flawed human being. Batman’s view of Dent is clouded by their one common object of affection – Rachel Dawes. The one character who is able to view Dent with cautious clarity is Lieutenant Gordon, the loyal police officer. He may be the only practicing Christian in the film. There is no reason to believe that his strong ethical approach to fighting crime (even more ethical than the incredibly violent Batman) is not born out of religious belief. We don’t need to see Gordon praying in Gotham City Cathedral to understand that he places his faith in something greater than Harvey Dent. Unlike his counterpart Dent, Gordon remains a character the audience can admire. In his role as police officer, he is able to practice a number of the works of mercy, both corporal and spiritual. The most poignant of these moments is from "Batman Begins," when he comforts the afflicted as he is the first to console young Bruce Wayne after he witnesses the murder of his parents. In "The Dark Knight" he visits the sick Harvey Dent in the hospital and, later, buries and prays for the dead. As one of the cops who isn’t corrupt, he is constantly admonishing sinners, bearing wrongs patiently and forgiving offences willingly. All the while, he is still able to do his job. He is no Lazarus figure, who needs miraculous assistance to come back from the dead. To the surprise of Gordon’s son (and the audience), this time it is Gordon who saves Batman. And he saves him with the same gifts and graces that we have been given. The antics of Batman and the Joker may thrill us, but in the end we can learn from the more human examples of sin and grace found in Harvey Dent and Jim Gordon. I think it is no extreme statement to say that "The Dark Night" invites its viewers to a little philosophy; beneath the character/motive surface is a subject/predicate layer and the drama of the movie extrapolates a kind of philosophical argument. The question, because this is an action movie, is what is goodness and how does an individual fight for it? The answer we want, because this is a Batman movie, is that goodness is the protection of the innocent and neutral. The mission of the good is to bring to fair justice the criminals who transgress against goodness; but the conclusion the movie delivers I believe falls short of a Christian kind of answer, as it glorifies the fight for goodness over the cost of a total commitment to truth. The Dark Knight took away Bruce Wayne's long-term, existential dilemma between right and wrong, giving him a certificate of clear conscience by the sole fact that the consequences of his altruistic lies brought hardships on him. I am referring to the blame Batman takes for Harvey Dent's murders. Batman's sacrifice takes its ignominy not so much from the act itself, morally poor as it is, but rather because it is the final word of the movie. The Batman spotlight is smashed and dramatic music cues the credits. During the course of the movie, two philosophies build through the character of Batman: 1) in order to bring into being a greater symbol of goodness and hope, honesty must be present. Batman's mask is the contra-element to honesty. 2) in order for an individual to have the greater impact in society, society must look favorably on him. The parallel development of Harvey Dent dramatizes the potency of this force Harvey gains more popularity with every big criminal he vows to bring to court; and despite Dent's objections to the necessity of Batman, Batman thinks of ending his career. How potent these philosophies are! Batman believes strongly that Dent, representing a greater honesty, is the future. His existential dilemma is how to bring about the transition of focus, to shift Gotham from a city of secrecy and Batman to a city of openness and Dent. The Joker keeps Batman from making his transition easy. A man without morals fights a man who strives to embody them; and the two and a half hours of action ensure us that it is no easy fight. Dent falls. He indulges vengeance and he kills; but the public image of Dent is allowed to go on by Batman's sacrifice of image. Here, Batman contradicts himself. The man who seeks to bring to justice corrupt officials, exploiters of the weak and poor, succumbs to play the same game of facades; and by doing so he begrudgingly admits that the appearance of truth is more important than its ontology. We viewers are left with the feeling that half-truths, whether employed by goodness or evil, will always be modus operandi; and if there is a way for unmasked virtue to change the world, it won't happen right now. And the movie ends with fanfare? Gordon's wife slapped him for faking his death, but the viewers applaud Batman for giving Gotham hope with a lie, for his "heroism." This would have been SO COOL in, say, 1965. I'm disappointed by the pandering from both students to this successful yet disappointing film. It's success lies simply in being a highly stylized sequel to a much better film with a single outstanding performance. Batman begins had legs, for all the right reasons that an action film should. A cohesive story, likable characters, great casting and ensemble acting, solid editing and a sense of humor about itself. Yes, Heath Ledger is amazing. Is he Satan or Satanic? That's an interesting thought. I do think he stood on the precipice of the abyss and stared in for a moment too long. I'm sadly not surprised that he could not survive his portrayal. It's that perverse. Christopher Nolan cuts the film to showcase that performance not to advance a theological story line. Cutting the film as he did, much of what made "Batman Begins" fun is lost in the process. Things I missed: - There are gadgets, but except for one involving a truck early on, you don't get to appreciate their coolness. The movie takes their presence for granted. - Fighting sequences. Any appreciation for technique and poetry are exchanged for frenzied blur and falling bodies. - Gordon being the everyman as the good cop. He's just a plot device here. - The breeziness of Lucious Fox. His character, the source of a lot of humor in "Batman Begins" is humorless. - The Alfred who rooted the Batman to Bruce Wayne and his legacy. In this movie Alfred doesn't give advice. Wayne just tells him what he's going to say. - Natalie. Upgrading to Maggie Gyllenhaal from Katie Holmes was a good casting decision. Why make the upgrade if you're going to put her on the sideline? Her character is in the film but much of your sense of her comes from Katie Holmes portrayal in "Batman Begins." - Eric Roberts. He's got the gravitas but not the lines or the scenes. He's the crewman on Star Trek with a red shirt. Filler. Absent that what you have is a one dimensional battle between Batman and The Joker. 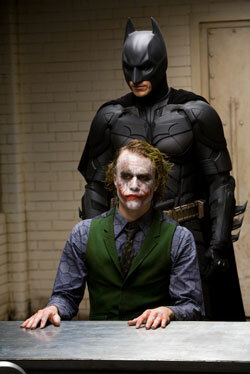 While Bale and Ledger hold their own on screen, after a while it gets boring. Enough already. The film could have ended--and should have with the oil barrel scene. Save who you can, arrest Joker and move on to the next installment. But this is the story of "The Dark Knight" and it's not enough to show that Bruce Wayne is losing his sense of himself to his character. That move is one of loss. No, Nolan's got to beat over your head the peril he's in. How do you keep going? Transform the nicest guy in the movie. And so you have the extended story line of Harvey Dent's. This is not a wolf in sheep's clothing anymore than we all have the capacity for doing good or evil within ourselves. Here's it's a bad acknowledgement of the uni-dimensionality of the story thus far. And so Nolan with this lame twist begets more Joker and means your watching for a half hour longer than you really want to. With "The Dark Knight" Nolan's Batman begins his fall into the same bloated abyss as "Pirates of the Caribbean." My worst nightmare? That the next one is three hours long. If you haven't seen it by now, don't go with the expectation that you will see a sort of parable. You won't. The film isn't worth reading that into. My advice: If you've managed to avoid it thus far, skip it. This article also appeared in print, under the headline "God & 'The Dark Knight'," in the August 18, 2008 issue.